Aopen HS-780 Headphones (Audio) - TACKtech Corp.
Headphones are crucial to anyone who enjoys listening to their audio alone or those of you who attend LAN parties frequently. If you are looking for some new headphones the Aopen HS-780 may just be the pair for you. Headphones are a very valuable asset if you attend LAN partys or enjoy listening to your audio privately. The headphones I will be testing today are the Aopen HS-780. These Aopen Headphones have a fairly well fitting headset design, the cups on the ears and the top headband have leather padding which makes them very comfortable to wear. The headphones seem a little flimsy however, because the head band is made of plastic, although it is padded with leather-like PVC material to provide extra comfort. The attached microphone is not flexible which can be a problem with different people as it cannot be shaped to fit different head sizes. 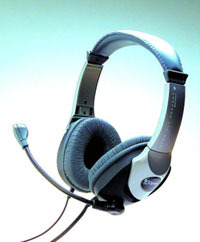 The Aopen HS-780 Headphones are very light weight with a closed ear design. The padded ear cups are extra large in order to provide increased comfort and improved sound quality. The headphones come with a 10 ft. cord, inline volume control, extra large padded ear cups and an omni-directional microphone. They produce exceptional audio quality for their price range and the omni-directional microphone is very sensitive. The headphones perform well both at high and low frequencies. However, you may hear a little bit of distortion if you are listening to music with lots of bass. The Aopen HS-780 Headphones perform very well. They also have a nice cord length (10 ft.) which can be very useful if you move around a lot. The headphones are priced at around $20 which is very reasonable, especially when you hear the sound quality that they produce. Nice cord length - Allows you to move around the room freely. Microphone isn’t flexible so you can’t bend it to your required shape.